Roshel's mil-spec Senator Armoured Vehicle features high levels of ballistic protection and integrated CBRN. 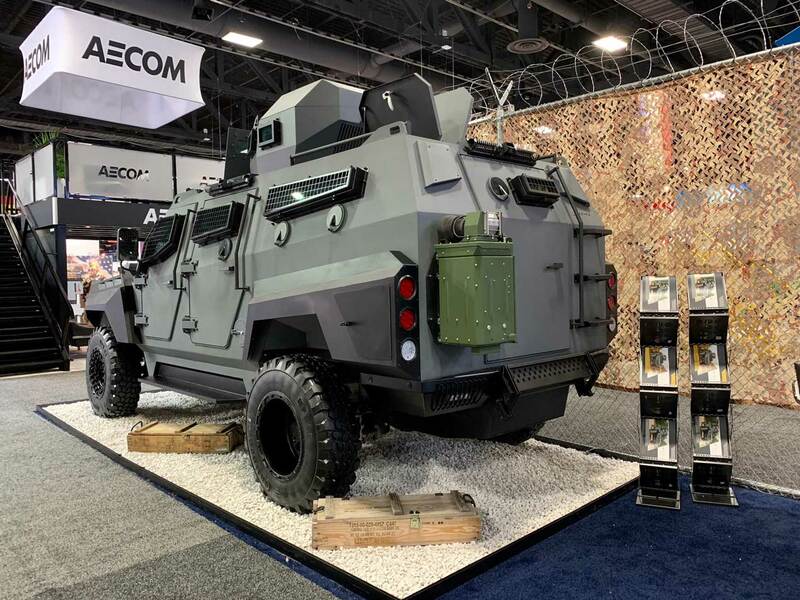 Roshel Defence Solutions unveiled its new mil-spec All-Terrain Tactical Vehicle at the 2018 AUSA annual meeting and exposition in Washington DC. The vehicle is designed for the law enforcement community, but is fitted with an impressive range of mil-spec survivability features including a certified ballistic steel and .50 calibre-rated bullet resistant glass capable of withstanding multiple hits, one-piece blast-resistant floor, gun ports, escape hatches equipped with a mounted turret system as well as mission-specific equipment and modifications. It can be modified to suit different layout requirements and door configurations (two-door, four-door, hydraulic ramp), depending on the mission. The vehicle also features active protection systems that ensure maximum operational efficiency. Despite the high level of ballistic protection, the vehicle remains lightweight and responsive and offers increased payload capability. It can transport up to 10-12 fully equipped officers. According to Roshel, the Senator Armored Rescue Vehicle's high ground clearance, four-wheel drive and 6.7L turbo diesel engine provides efficient off-road capabilities for natural disaster operations. Roshel has also developed and implemented a series of tactical solutions, such as an integrated CBRN (chemical, biological, radiological and nuclear) system with a built-in air conditioning and filtration solution, eliminating the need for personal gas masks in the fully insulated vehicle; explosive gas detection system with the capability to detect and measure toxic and explosive gases; a highly accurate radiation detection system; Mil-spec heavy-duty electric winch; IED blast seats; and emergency and convoy lighting package. The vehicle also features advanced built-in observation, surveillance and security systems including a high-resolution camera with a thermal imager and long-range infrared projector, and 360-degree security cameras installed around the perimeter of the vehicle along with a two-way communication system. All collected tactical data can be transmitted through an encrypted channel to the command control centre. Recently, the Senator Armored Rescue Vehicle underwent extensive ballistic and operational testing against most common Special Response and Tactical Teams’ requirements, including steerability, stability, braking capability, tilt-table strengths and others. The vehicle is based on a heavy-duty commercial platform with widely available spare parts to keep its maintenance easy and low-cost. “With our new Armored All-Terrain Tactical Vehicle, we didn’t want to create just another regular armoured truck,” said Roman Shimonov, CEO of Roshel Defence Solutions.